Biggsville Township H.S. "Red Devils"
The town of Biggsville (population 343) is located on U.S. Route 34 at the intersection with Il. Route 94 in northern Henderson County. This places Biggsville about 14 miles southwest of Monmouth. The Burlington Northern Santa Fe (BNSF) Railroad runs through the town and the South Henderson Creek loops over the north side of town. 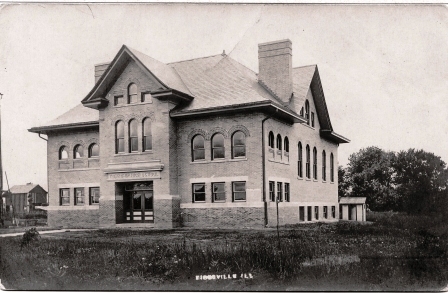 "A Short History of the Biggsville High School"
On April 13, 1895, an election was held in the First National Bank of Biggsville for the purpose of voting for or against a township high school. The vote was in favor of the school. The high school probably started operation in the fall of 1895, but there is no record as to where school was held. The first election for directors for the new school was held May 18, 1895. Those elected were: Isaac William McQuown, Henry Cowden, August Wiegand, Robert McMillen, and William Plummer. 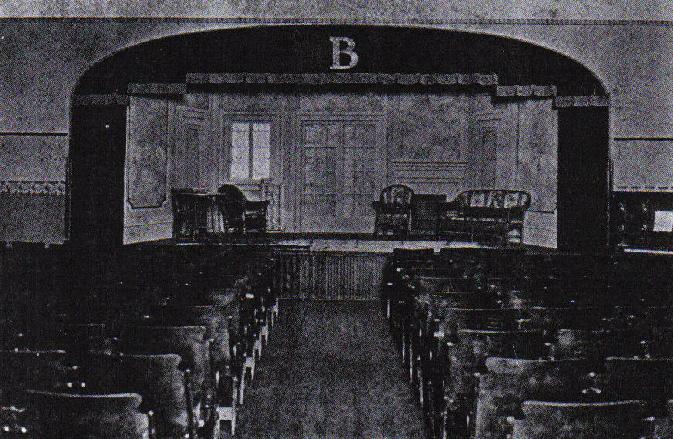 The first high school building was built in 1896 and sat just west of the present Biggsville Methodist Church. The cost of the frame structure building was $8,000. It was not modern by today's standards. Mr J. A. Strong was the first principal. His salary was $850 per year. He organized the school, bought and arranged the library, prepared the first couse of study, provided the system of records, secured the laboratory equipment, and did all the teaching himself for the first few months. The high school course of study was limited to three years from 1896 to 1900. Then it was increased to four years. Students were admitted to the high school by examination only. In 1900 the school library had 600 books. These books were selected with reference to the course of study. The school was on the accredited list of the University of Illinois. The first high school building and its contents were destroyed by fire on July 26, 1906. Classes were held in the Wiegand Building on Main Street while the new building was being built. The second high school building was built in 1906-1907 and was occupied in 1907. Members of the school board were: August Wiegand, D. F. Whiteman, John McIntosh, Dr W. A. Henderson, and John Pearson. L. O. Culp was principal. Diplomas were issued to those who had completed the four years work prescribed in the course of study. In addition to completing the course of study, students were required to write a thesis of not less than 1200 and not more than 2000 words. The use of tobacco in any form was forbidden on the school grounds. Violation of the rule was considered cause for suspension or expulsion. During the early years various means of transportation were used to get to school. Some students rode horses to town, stabled them, and rode them home after school. Cars furnished a popular way for those who could afford them. Busing of students started during the 1940s. At first there was only one bus, and it had to make several trips to get students to school and back home. Later, more buses were added. Hot lunches were introduced during the years 1948-1949. Meals were first served in the home economics room. Later, lunches were prepared and served in the gum. 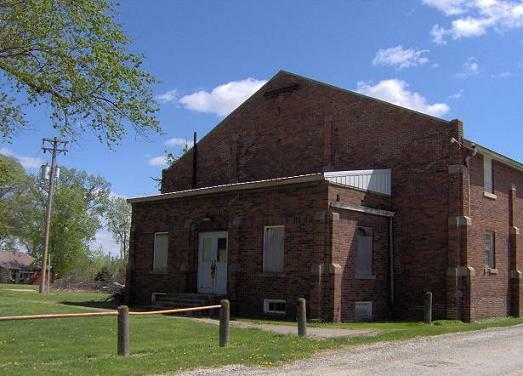 The brick gym was built in 1925, after a frame building, built three years before, was destroyed by fire. 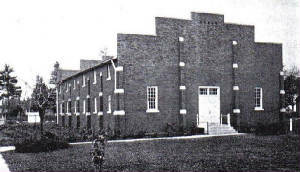 The new addition to the second building (pictured)was ready for the school year 1949-1950. The new facilities gave much needed equipment and space for science, home economics, and vocational agriculture. 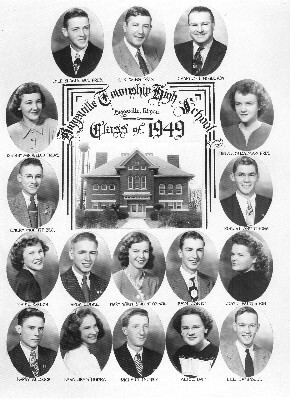 The Class of 1960 was the last class to graduate from the old Biggsville Township High School. The Class of 1961 was the first to graduate from the new Union High School." The town of Biggsville is technically the address given to Union High School, though the school itself is located in the country two miles west of Biggsville at the intersection of US 94 and US 34. The fate of the original Biggsville High School building is being sought. If you have any information on Biggsville High School please write us at ihsgdwebsite@comcast.net . Biggsville High School offered basketball and probably baseball, possibly football. But make no mistake about this, they offered track and field with a bang! 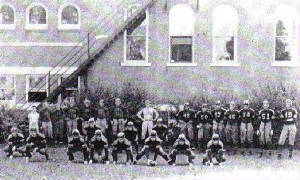 The Biggsville boy's thinclads were the Illinois State Champions after the 1898-99 and 1899-1900 school years! The boy's teams also brought home IHSA hardware in basketball winning two DIstrict titles. The great accomplishments of the Biggsville athletic program are listed below. "The boys' basketball coach during the successes of the team at least from 1945 through 1949 was Coach Stephen F. (Steve) Ingold. He also coached all other sports (football, softball, track). 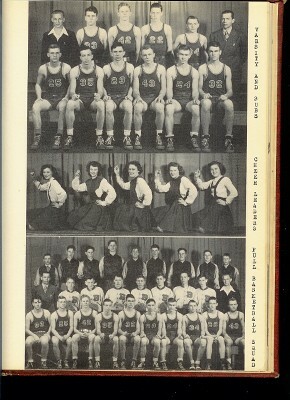 The basketball team of 1946-1947 won the District and Regional basketball tournaments and advanced to Sectional and were defeated at the Rock Island H.S. field house by Sherrard High School in the first game. Members of that team were Phillip Law, James Smith, Hauer Noble, Daryl (Ozzie) Baylor, Paul Allen, and Karl Henry." Lost to Sherrard in 1st Rd. Check out the information provided by Lyle Slagle regarding Biggsville Township HSs great team. The names are provided in reference to the photo above to the right. Front row (l to r) Karl Henry, forward; James (Jim) Smith, center; Paul Allen, guard; Phillip Law, forward; Daryl (Ozzie) Baylor, guard; Hauer Noble, forward/center. This team had a record of 25 wins and 5 losses. Points scored by individuals: J. Smith (323), P. Law (266), K. Henry (279), P. Allen (166), D. Baylor (130), H. Noble (101). Move over Milan and Hebron, this may be an even more incredible accomplishment when you consider all of the facts. The Biggsville boys track team won back to back state championships in 1899 and 1900. They followed this up with a 8th place finish in 1909. This was accomplished under a one-class system!! One might wish to think that the competition must have been sparse for Biggsville to accomplish this so long ago. Take a look at the list of schools they had to defeat in order to win the title. Track was set up in 1899 as it is today, with one great athlete being able to dominate and bring home a team title by himself. However Biggsville's two titles came with the great athleticism of four different athletes. Without a doubt the "stud" of the group was Cliff Bell, who brought home a total of six gold medals in three different events. Also bringing home gold was Dave Daugherty, James Stewart, and Herman Dixon. Coach of the 1899 team was J.A. Strong, and of the 1900 team was Honey Stuart. The great accomplishments, which have not been nearly enough written or talked about (in my opinion) are listed below. Chicago Lakeview, Chicago English, Rantoul, Lagrange all tied with 4 points. *Oscar Clifford Bell was born on 03-15-1880. He went on to attend the University of Illinois on a track scholarship after leaving Biggsville. He earned his degree from the U of I in 1902. He began law school at the age of 36 and later became an attorney and ultimately a judge in Cleveland, Ohio. Two of his medals are still in the possession of his daughter Thalia. Cliff Bell passed away in 1943. Oscar Clifford Bell did not have to come far to make an impact on Monmouth College. Born in Biggsville March 15, 1880, to William and Sarah Martha Bell, he attended the local one-class school. In 1899 and 1990 little Biggsville won the state track championships, stunning the larger schools—Bell bought back gold in the 50 yard, 100 yard and 200 yard dashes each year. The success of tiny Biggsville was attributed to the two star trackmen being 23 and 24 years of age, though a quick check of census records shows that this was merely jealousy on the part of the city schools. Bell was, of course, twenty in 1900, his companion twenty-one—not that unusual in an age when boys worked in the fields spring, summer and fall, and probably in his father’s store in the winter. But the athletes beaten in 1899 were so angry—according to the Chicago Tribune—that they tore up the railroad cars they were riding in, and an investigation was launched. 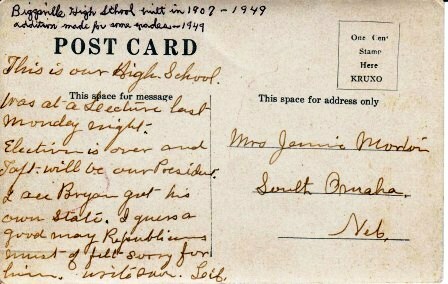 He accepted a track scholarship to the University of Illinois in the fall of 1900, playing football, too, as a reserve halfback for one season—the Chicago Tribune referred to him as the Biggsville sprinter; according to the Tribune, he was elected captain of the track team after the 1901 season and was the only Illinois sprinter to win races in 1902 against Michigan and was out with illness during the big match with the University of Chicago. He apparently returned home after graduation in 1902, then two years later applied for a coaching position at Monmouth College—then the largest private college in the state. (Not that big, of course—they were all tiny.) This application is not surprising. His sister Olive (born 1878, teaching music in 1900) was in the class ’06 (she later married John Burnside) and Pansy, ’03 (born 1882) was still living with Cliff and Olive from 1903 to 1906 at 416 S. Fifth, but later became a music teacher at Bethany College in Kansas. “O.C.” Bell’s 1905-06 teams had an 18-1 record. Assisted by A. J. Taft, his football teams swept to the championship of Illinois in 1905, then lost to the University of Iowa. Most of the opposing teams were from high schools, but this was unavoidable—most colleges did not field teams. Even then, because Knox and another opponent had dropped the sport for the year, 1906 was a short season. Only Milliken managed to score points (losing 25-9), and the team concluded the season by drubbing the champion of Wisconsin and Michigan, Beloit College, 10-0 in the final game. His specialty, of course, was track. And he coached baseball as well. 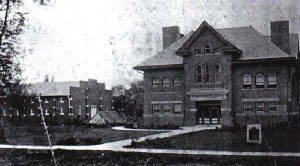 The 1908 Ravelings commented that “no one in the history of the college has put forth more effort, been attended by more success, or raised athletics to a higher standard.” It helped that Monmouth was the largest college in Illinois, but the secret was that “he exercised rigid discipline and got more from his men than they thought possible.” Introducing the forward pass and the on-side kick, he went on to coach at Missouri State Normal (now Truman State) for two years." 1908-09 Team Finished 8th at Illinois State Track Meet! Other Individual Medal Winner in Biggsville High School History. The boys of Biggsville were, according to our good friend Tom Sickorski, always a football force to be reckoned with in the old Valley conference in the 1950's, Biggsville finished no lower than 2nd for 6 straight seasons under veteran coach Doc Evans. We are seeking further information on any other sports offered at Biggsville High. It would also be interesting to know what happened to the great athletes such as Cliff Bell and Dave Daugherty. Did they pursue track in college? Where are the medals and trophies that they won?